I debated doing pregnancy updates. I think for a long time I felt really superstitious about it. But with the spirit of the new year burning inside me, I’ve chosen to enjoy and celebrate. So, that includes doing some updates like I did when I was pregnant with Ada. Covering the important stuff. Some trivial stuff, too. I've been feeling the baby kick for several weeks. I didn’t know for sure if that was what I was feeling at first, but when I used my Doppler, I got the same sensation right where I was picking up the heartbeat. Oh, and if you’re pregnant after loss, I really consider the Doppler essential. I can’t begin to describe how it has eased my anxiety. My weight has fluctuated a lot in the past year. So, when I got pregnant, I was around 138 pounds. I lost five pounds throughout the first trimester. I’ve gained two from my starting place (yay food!) over the holidays. But this morning I’m back to 138 again. I gained 25 with Ada, but I’m almost certain I’ll gain much more this time around because I’m taking exercise less seriously. I also don’t care as much this time around (despite weighing myself -- it’s because I’m wanting to see the number climb, actually). I look at least 20 weeks pregnant by the end of the day. 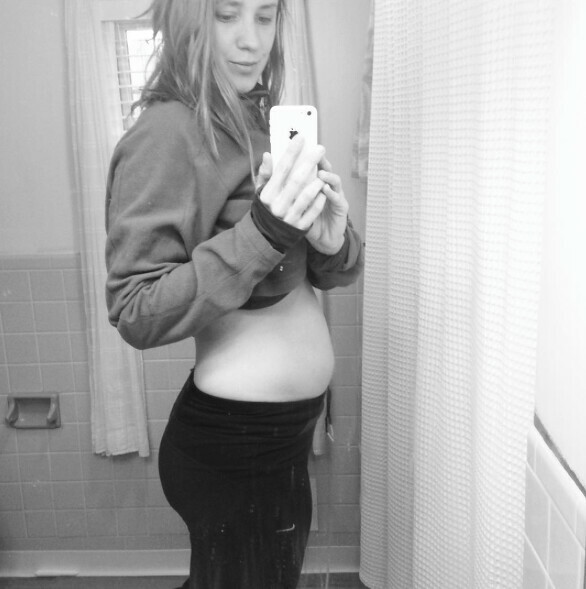 My stomach muscles have been so relaxed and with food, water, and gravity, it’s astounding the belly I have at night. I look back at photos of my first pregnancy and how I said I have a bump and just laugh. No. THIS is a bump. The photo above was taken in the morning, so maybe I’ll do an evening one next time to show you what I’m talking about. And it’s going to be HUGE! I will say that since I went off progesterone, though, the bloat has gone down considerably. I wake up at least four times a night to pee. I started sleeping with my Snoogle and haven’t looked back. I had it when I was pregnant with Ada, but it never felt totally comfortable. This time around? I cannot live without it. I even bought a new jersey knit cover for it -- best investment ever. I crave Justin’s milk chocolate peanut butter cups. I also drink a kefir smoothie every single morning, usually with mango. In other news: Our freezer is full of frozen berries that I plop into anything from smoothies to oatmeal. I may even eat some cold. I do still have an aversion to eggs, but I’m working through it (same thing happened with Ada). I’ve also started adding greens back into my diet again. It’s been rough. My nesting is already in full swing. I think it’s because I’ve had way too much time to think about it. I’ll do a full post, but we got a new crib, changing table/dresser, rug, glider, car seat, ring sling, and even some cloth diapers. We don’t expect to have a shower this time around, so we’ve been buying when we can afford things (and using gift cards/etc.) along the way. It’s nice to know the things we used the first time around so we can skip the extras. Sadly, a lot of our gear is just shot so it’s like we’re starting over! Ada’s signed up for a big sister class at the hospital where we plan to deliver. I’m excited for her. It isn’t until April, but there’s also a hospital tour included. I know the inside and out of that place, but it will be fun to visit again. I think we’re skipping any childbirth classes this time around. Honestly, Ada’s birth was so fast and furious, I’m a bit nervous that this one will come even faster. Days till due date: 174!